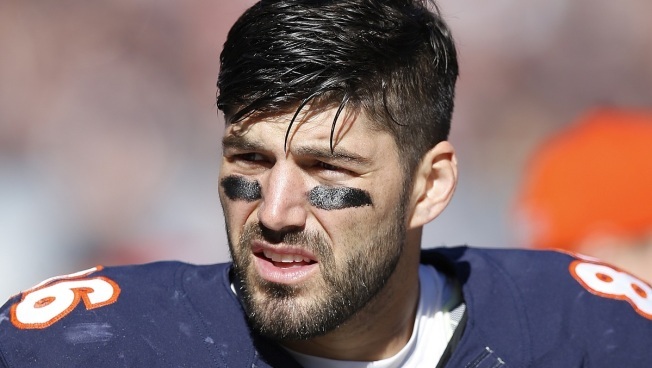 The Chicago Bears may not see tight end Zach Miller ever take the field again, but the team did something remarkable on Monday. The Bears have re-signed the veteran tight end to a one-year contract for the 2018 season. "It makes us so happy to say... WELCOME BACK, ZACH," the team tweeted. Under the terms of the agreement, the Bears will pay him $458,000 whether or not he plays during the 2018 season, and the contract also means that Miller will be able to use the team’s facilities for rehab and will have access to the team’s medical care, according to NBC’s Pro Football Talk. If Miller is able to play, the contract will pay him $790,000. Miller suffered a catastrophic knee injury last season in a game against the New Orleans Saints. The injury forced Miller to miss the remainder of the season, and came very close to costing him his leg.